President Donald Trump said Monday that he would be willing to meet “anytime” with Iranian President Hassan Rouhani without any preconditions, despite his previous reneging on an international nuclear deal and tweeting threats in all-caps to Iran’s leadership. “Good for the country, good for them, good for us and good for the world. No preconditions. 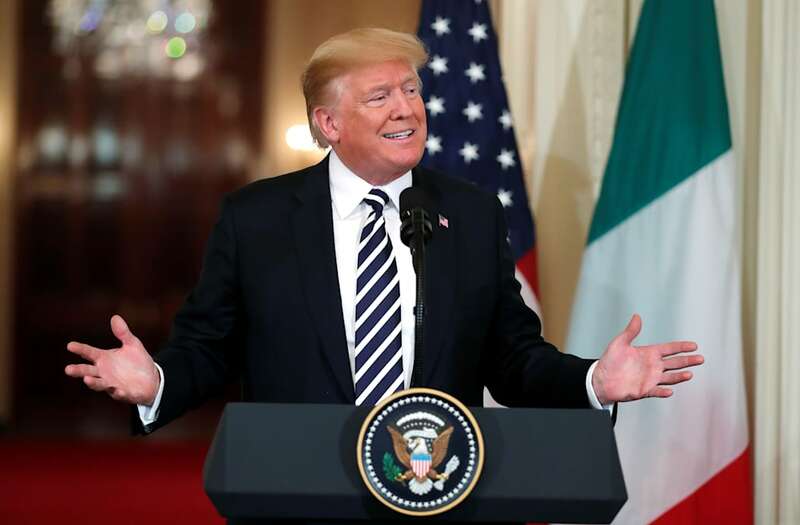 If they want to meet, I’ll meet,” Trump said at a White House news conference with Italian Prime Minister Giuseppe Conte. It seems, however, that neither Iran nor Trump’s own administration is keen on the idea. Hours before Trump’s remarks, an Iranian foreign ministry spokesman said the U.S. president’s policies regarding Iran ― including the withdrawal in May from the Iran nuclear deal and the reimposition of sanctions ― undermined any chance of engagement between the two nations. In a tweet responding to Trump’s offer, an adviser to President Rouhani later said Iran would be open for talks only if the U.S. “return[s] to the nuclear deal” and respects “the Iranian nation’s rights,” per a BBC translation. Iran wasn’t the only one to dismiss Trump’s overture. U.S. Secretary of State Mike Pompeo appeared to contradict the president, telling CNBC that while he supported Trump’s desire to meet with Iran, he stressed that the two sides would only meet if several preconditions were first met. “If the Iranians demonstrate a commitment to make fundamental changes in how they treat their own people, reduce their malign behaviour, can agree that it’s worthwhile to enter in a nuclear agreement that actually prevents proliferation, then the president said he’s prepared to sit down and have a conversation with him,” Pompeo said. Trump has, in recent days, been engaged in a war of words with Iran. Last week, Trump warned Rouhani in the tweet below. Iran brushed off Trump’s threatening tweet with an all-caps message of its own.